Are Inland Fisheries Ireland’s Elver Trapping Indices Accurate? The European Eel has been listed as ‘Critically endangered’ according to the ‘Red List No. 5: Amphibians, Reptiles & Freshwater Fish’ (King et al., 2011). This is a reflection of the significant International decline of this species. Inland Fisheries Ireland has tasked itself with monitoring the eel population since the implementation of the National Management Plan in 2009. A detailed monitoring programme was outlined in this plan and the Eel Monitoring Programme (EMP) has attempted to fulfil all of these tasks. The monitoring of recruitment of eels in Ireland is important to determine the success of the EU eel regulations. There are still significant numbers of glass eels and elvers in the Shannon region, These numbers are not being indicated by Inland Fisheries Ireland’s monitoring programme. While it is not disputed that stocks of juvenile European eels returning to Irish and other European rivers have declined dramatically, it is not clear what Inland Fisheries Ireland is contributing to measuring this decline. Inland Fisheries Ireland chose, for wherever reason, to not consider one of the largest and most important research project on glass eels and elvers to be ever undertaken in Ireland in their Eel Management Plans. This was a major PhD research project that was undertaken by Dr. William O’Connor during the period 1994-1998 (glass eel fishing in 1997, 1998 & 1999) (O’Connor, 2003). This important work has been omitted from all consideration in the Shannon International River Basin Eel management Plan, and work and achievements during the period of the O’Connor (2003) study has been falsely credited to themselves by Inland Fisheries Ireland. It is also noted that the elver trap shown in O’Leary et al (2012) of the report was designed (based on earlier ESB design) and built by Dr. William O’Connor, although no credit is given for this. The catches obtained during Dr. William O’Connor’s study dwarf anything achieved since this time – just compare the catches at Ardnacrusha for the year I was there against the years when I was not there. Some of this is likely to be due to the international decline of the European eel, but it is clear that not all of the drop in catches can be explained by this. During Dr. William O’Connor’s study exceptional results were obtained in relation to catching glass eels and elvers. Indeed, during the most intensive period of the study over 20 million juvenile eels were captured (a catch worth several million euros in today’s prices). The key finding of the O’Connor (2003) study, ignored by Inland Fisheries Ireland in their Eel Management Plan, was that despite the global downturn in eel numbers hugely significant catches of both glass eels and elvers could be made with determined and focused effort. The annual catches made during the most intensive period of Dr. William O’Connor’s study also exceeded the catches of any the previous catches since 1980, and (temporarily) reversed the decline in eel catches recorded on the River Shannon. It is clear that catch effort, and the quality of this effort, can have a highly significant influence on results obtained. The fact that effort has not been consistent renders the Inland Fisheries Ireland indices for glass eels and elvers in the Shannon International River Basin as meaningless, and also calls into question the validity of all the trapping indices being used nationally in Ireland. It is likely that that catches of elvers for conservation stocking at many sites in Ireland, such as the ones in the Shannon Region, could be significantly increased with the involvement of incentivised private sector expertise, rather than the use of these funds within the public sector. An urgent best effort approach is needed now to maximise use of available glass eel and elver resources to save this species and restore its fisheries. 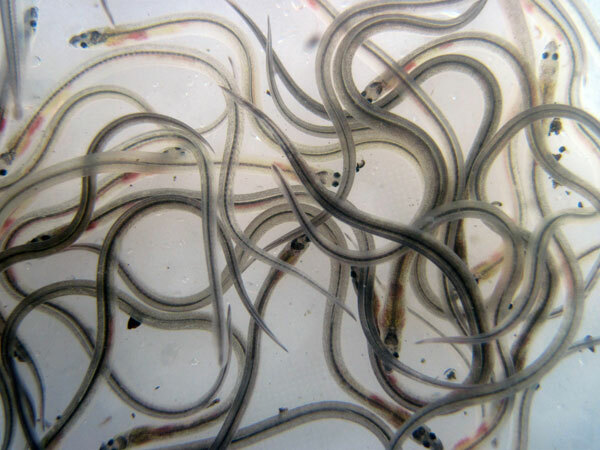 Banning of all eel fishing, which is has occurred in Ireland, is not be the most prudent use of available glass eel and elver resources – especially when it is based on indices that simply don’t hold up to scrutiny. According to O’Leary et al (2012) the Inagh recorded a large increase in elver catch, increasing from 1 ½ kg in 2010 to 8 kg in 2011. However these are essentially insignificant numbers and it is not clear what catch effort is being put in place at this site, and what other factors are affecting the use of this site as an eel index. In the O’Connor (2003) study it was pointed out that catch effort is the key issue at sites such as the Inagh River. O’Connor (2003) recommended the use of both dip netting and trapping at this site. 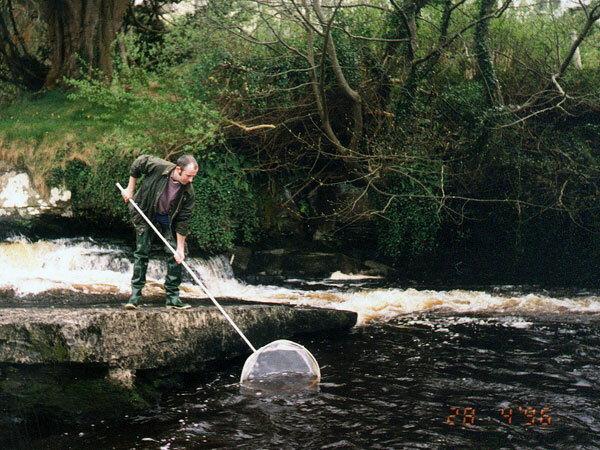 In 1996 a total of approximately 400,000 elvers (140 KG) were captured at this site in 5 days intensive survey work during May and June, using a combination of trapping and dip netting (O’Connor, 2003). Indeed, the vast majority of elvers at this site were collected by dip netting, and not by trapping which was found to be relatively ineffective at this location. Inland Fisheries Ireland currently only use trapping here (with one of Dr. O’Connor’s traps). It is noted again that this work was carried out by Dr. William O’Connor and not by the ShRFB (now Inland Fisheries Ireland) as claimed by O’Leary et al (2012). It is clear based on the results of O’Connor (2003) that elver catches at sites such as Ennistymon falls can be significantly increased with suitable effort, despite the global downturn in eel stocks. It is also clear that the efforts made at this site during the 1990s (which mainly involve intensive dip netting efforts) render the use of data from site as meaningless. Dr. William O’Connor dip netting elvers at the falls in Ennistymon during 1996. In 1996 a total of approximately 400,000 elvers were captured in a 5 day period using a combination of trapping and dip netting (O’Connor, 2003). It is noted that this work was not undertaken by the ShRFB as claimed by O’Leary et al (2012), and calls into question the accuracy of elver trapping index data being used by Inland Fisheries Ireland. According to O’Leary et al (2012) the Maigue recorded an increase in elver catch from 3 kg in 2010 to 5 kg in 2011. These are again insignificant numbers and it is not clear what catch effort is being put in place at this site, and again what other factors are affecting the use of this site as an eel index. In the O’Connor (2003) study it was pointed out that catch effort is the key issue at this site. During 1996 and 1997 when intensive work was undertaken at this site by Dr. O’Connor a total of six ramp traps located at each side of three weirs were utilised. It was found however that efficiencies at these sites were very low, with most elvers bypassing traps. The trapping sites were also influenced by the tides, so operation of these traps required careful timing of visits to empty the traps. During 1996 and 1997 most of the elvers were captured over a few days when Dr. O’Connor (along with assistants) stayed on the site overnight. Due to the difficulty in operating these traps, it was not decided to extend this effort over the full season, and the traps were not operated as intensively in 1998 and 1999. 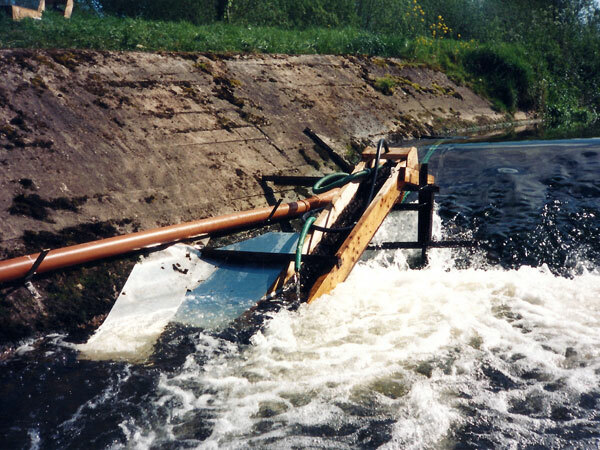 It is clear that due to tidal influence (lower two weirs) and ease which elvers can pass traps at the upper weir, this site is not considered to be suitable for use as an index trap – particularly on a national programme. The selection of this site as a national monitoring site calls into question the accuracy of Ireland’s national eel monitoring programme. 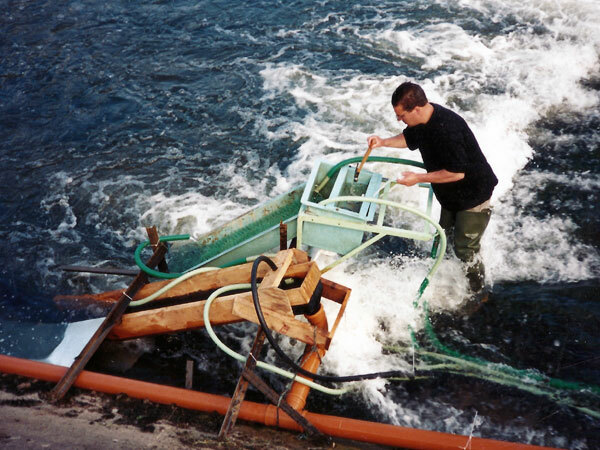 Patrick Real working on the River Maigue traps, June 1997. Dr. William O’Connor and Patrick Real captured over 0.5 million glass eels during the week following this picture. This work was not completed by Inland Fisheries Ireland. One of the other elver traps that were operated during 1996. It proved very difficult to corral elvers into these traps, despite the modifications shown above. The level of effort required and impact of water levels at this site means it is unsuitable for use as a national index site. O’Connor, W. (2003) Biology and Management of the European Eel Anguilla anguilla (L.) in the Shannon Estuary, Ireland. PhD Thesis, National University of Ireland, Galway. O’Leary, C., Becerra Jurado, G., Cruikshanks, R., and Gargan, P. (2012) Inland Fisheries Ireland Eel Monitoring Programme 2009 – 2011. IFI/2012/I-4094.